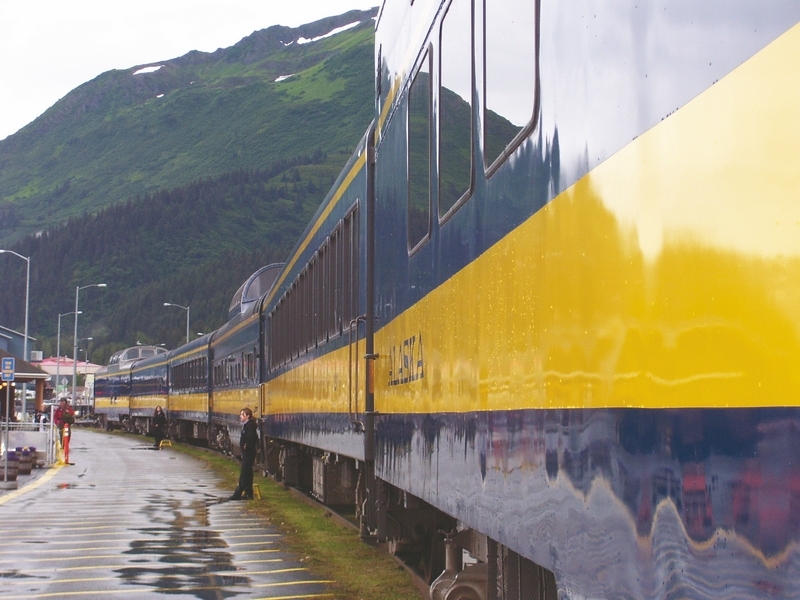 On a rainy day in Seward, the Alaska Railroad crew prepares to board passengers for Anchorage. Check-in and boarding are fast and efficient. The Seward station is a half-mile from the cruise ship dock. “Dall sheep on the right!” the Alaska Railroad narrator shouted. Twenty heads swiveled and hands fumbled with cameras. Earlier we spotted moose, a beaver dam, three soaring bald eagles, four pairs of trumpeter swans”and fishermen vying for salmon. Husband Rob and I were on an Alaska Railroad “land cruise” through world-class scenery inaccessible to motor vehicles. Twice the size of Texas, Alaska has fewer miles of road than Rhode Island. The train is a safe and relaxing way to see the wilderness in comfort and style. After boarding the Seward-to-Anchorage Coastal Classic train, we were dazzled by spectacular glaciers nestled in towering Sitka-spruce-clad mountains, cascading waterfalls and mountain meadows drizzled with red fireweed and other colorful wildflowers. Pulled by a diesel engine, the 14-car train climbed steep mountain grades and crossed bridges and trestles over rushing rivers before arriving in Anchorage . This progressive city’s handsome new buildings are accented with bright summer flowers. Our stay at the Hampton Inn included internet access, breakfast, a pool and train station shuttle. For the Anchorage-Denali and Denali-Fairbanks segments, we upgraded to Gold Star (first class) in a double-deck dome car with an outdoor viewing area, non-alcoholic beverages and an exclusive dining car, where a bartender served libations. The northbound train followed the serpentine banks of the Susitna River, an area thick with bears. As the train climbed toward the tree line, we crossed the 914-foot Hurricane Bridge. It’s the longest span on the route, high above Hurricane Creek. As we approached Denali National Park, the sun broke though the clouds and a ripple of excitement permeated the car. Before boarding the Denali Star train, we dropped luggage at the Anchorage depot for automatic delivery to Grande Denali Lodge. A free park shuttle bus took us to Denali dog kennels where park rangers explained how dog teams patrol the park and haul freight in winter, then they demonstrated a wheeled sled run. Scenery was spectacular as the train pulled away from Denali Park station and entered 10-mile Healy canyon. Swollen by summer rain, the Nenana River surged through steep cliffs. The track levels out through the deciduous forests of interior Alaska. Birch, willow and aspen fill the landscape where gold miners once sought their fortunes. In Nenana, we passed one of — original Alaska Railroad depots, now a museum and gift shop. While bi-level Gold Star cars have steep spiral staircases, Alaska Railroad strives to be accessible. “The crew was very accommodating . . . I used a lift to get to the first level of the Gold Star car, then took the small elevator to the seating level and later rode the elevator down to the dining car and restrooms,” said Silvia Sutphil of Tampa, who uses a walker. Train service terminates in Fairbanks, home to the University of Alaska, a new Alaska Railroad depot and a bevy of other spiffy structures”definitely not the frontier town I had expected. Bidding a fond farewell to the train crew, we set off for new adventures. The University of Alaska’s Museum of the North is a must-see for the in-depth look at the Aurora Borealis, Alaska’s famed northern lights, but too soon, it was time to start the long journey home.